VESDA solutions provide the earliest possible warning of an impending fire hazard, buying time to investigate an alarm and initiate an appropriate response to prevent injury, property damage or business disruption. 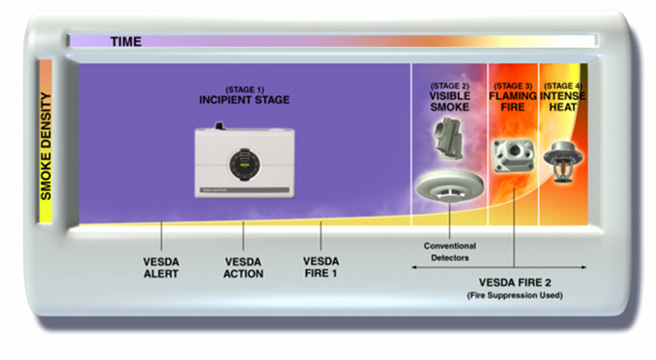 Because VESDA has the industry’s widest sensitivity range and multi-level warnings, even minute levels of smoke can be detected before a fire has time to escalate. VESDA works by continually drawing air into the pipe network via a high efficiency aspirator. A sample of this air is then passed through a dual stage filter. The first stage removes dust and dirt from the air sample before it allows the sample to enter the laser detection chamber for smoke detection. The second (ultra fine) stage provides an additional clean air supply to keep the detector’s optical surfaces free from contamination, ensuring stable calibration and long detector life. From the filter, the air sample is passed through to the calibrated detection chamber where it is exposed to a laser light source. When smoke is present, light is scattered within the detection chamber and is instantly identified by the highly sensitive receiver system. The signal is then processed and presented via a bar graph display, alarm threshold indicators and/or graphic display. The VESDA detectors are able to communicate this information to a fire alarm control panel, a software management system or a building management system via relays or a High Level Interface (HLI). VESDA systems also has its own communications loop called VEDSAnet. VESDAnet is a comprehensive fault tolerant “closed” 2-wire communications loop. It links the detectors, displays, programmers and remote units on a daisy chained loop. VESDAnet allows for a number of units to be programmed together from one or more locations and automatically detects communication failures. 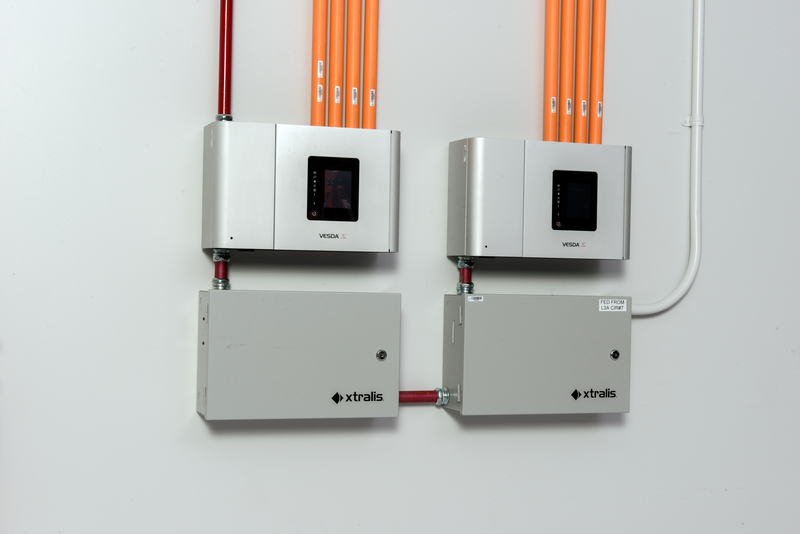 It also allows for easy interfacing with systems external to the network, such as intelligent fire alarm panels and building management systems.